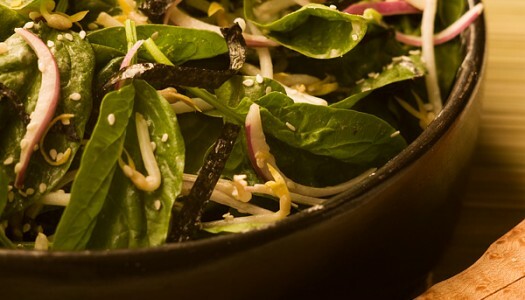 Light, crisp salad greens, fresh vegetables, and a tangy, well balanced dressing tastefully completes any meal. Skip the store bought croutons and impress your table with this homemade version. Chewy on the inside while irresistibly crisp on the outside, these croutons bake in the oven while you get the rest of the ingredients ready. Finish by adorning this versatile salad with unbeatable crunch. Begin with the croutons. Preheat your oven to 375ºF (190ºC). Sprinkle the baguette with water and toss briefly to allow the water to absorb evenly. Drizzle the olive oil over top and mix to coat. Scatter the baguette cubes on a baking tray and toast in the oven until golden brown and crisp, 15 to 20 minutes. The water will keep the interior chewy while the oil crisps the outside. Next, craft the dressing. Place the olive oil, Dijon mustard, honey or maple syrup and vinegar in a large jar, seal tightly and shake vigorously until smoothly combined. Finally, make the salad. 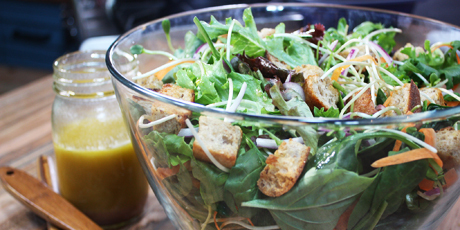 Toss all salad greens, sprouts, carrots, red onion and herbs. Drizzle a few spoonfuls of the dressing onto the salad, just enough to lightly coat the works. (Save the leftover dressing in the refrigerator for next time.) Quickly and gently toss the salad until it’s evenly combined. Top with the croutons, serve and share. I love fruit. I live for fruit. I'm powered by fruit! 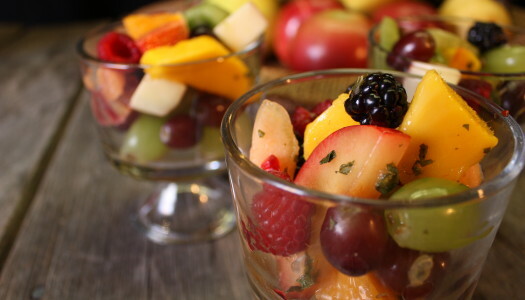 When fruit is properly ripened, it can be one of the best things to eat, so when you combine all your favourites together in a fruit salad, it can be a revelation. How about balancing all that sweet with some sour lime, spicy chilli and cooling mint? Or what about using a secret ingredient that pairs perfectly with fruit? No one will ever know that it's vanilla adding that mysterious yet familiar flavour.